Public Security Minister Khemraj Ramjattan has revealed that effective immediately, the Deputy Director of Prisons Gladwin Samuels has been asked to proceed on leave following the unrest at the Camp Street prison. Samuels, along with Officer in Charge of the Camp Street Prison Kevin Pilgrim were fingered by prisoners on Friday, as having left fellow prisoners to die. 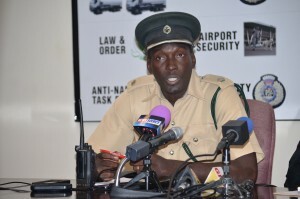 “Samuels who is the Deputy Director will be on leave for the next six weeks for good reasons as a result of a perspective given by both the director of prisons, myself and Mr Harmon,” said the Public Security Minister. Ramjattan said that the move was done for both his interest and the interest of the Prison; Samuels proceed on leave. “It’s about a winsome opportune moment for him to go on leave,” said Ramjattan. Meanwhile, Pilgrim who sat beside Ramjattan at the press conference made a public apology to all those that were affected by the Camp Street unrest. “I would first want to say on my behalf that I am sorry…I know saying sorry is not an excuse as the Minister would have made mention that a Commission of Inquiry would be launched and that Commission of Inquiry would do a detailed investigation,” said the Superintendent of Prisons. Pilgrim said that he was entrusted with the care of the Prison facility and he does not need a COI for him to apologize for the three day unrest. “I don’t have to wait on an inquiry or an investigation to simply say sorry because I am responsible for a prison location…Like a soldier, you have to be responsible for everyone under your charge,” he said. Pilgrim reported too that with the help of the joint service some amount of normalcy has been restored by at prison.